IKEA has always fascinated me. It isn't just a case of aesthetics - I am not one to care for much in that department. Nor do I have a particular affinity to particle-board furniture. Rather, what attracted me to IKEA was the fact that they offered a rare commodity - a frustration-free sense of accomplishment. Case in point. We recently bought a regular ol' sofa, and while I was setting it up I came upon a very unwelcome sight. The main drill holes that were meant to attach the base to the back, had been drilled incorrectly. I had two options, pack the whole sofa that I had just unpacked after lugging it into the house from the rented SUV and take it back, or drill a couple of holes and fix it myself. Naturally I chose the latter. That is when the problems began - the biggest drill-bit I had was too small for the bolts. When I got the pilot holes in, they were slightly off where they had to be. And to make matters worse, I did not have a long enough cord for my drill and had to constantly switch to the nearest power outlet. In short I spent more effort and derived more frustration drilling two holes, than I did finishing up the rest of the assembly. I am sure most of that has to do something with me, but that is beside the point. Contrast that with the IKEA experience. No holes to drill, no tool bigger than a screwdriver and every nut & bolt accounted for. Nevermind that every board I pick up is little more than saw-dust compressed together with glue; or that the mirage of the perfect IKEA room can never materialize in real-life. What IKEA sells is the experience - one that starts from impossibly perfect model rooms, to the warehouse with meticulously numbered aisles and bins, to the involved yet easy construction. A frustration-free sense of accomplishment. 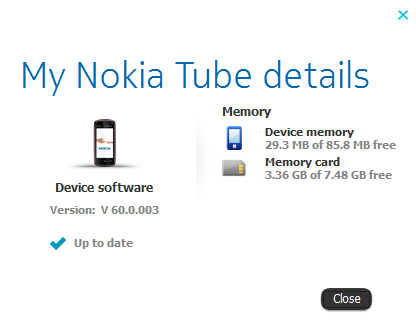 All said and done, Nokia has impressed me with their steadfast loyalty to their first ever touchscreen phone, my Nokia 5800. It has been close to three years since it's release, and over 2.5 years that I have owned it, and the company continues to roll out significant upgrades to the phone. The latest upgrade puts the firmware version at v60.0.003. A couple of differences with the present upgrade - this did not happen over the air (OTA) as most of the other upgrades, signifying that this is a pretty important change. 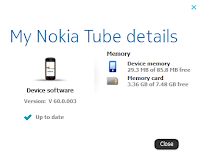 Secondly, the notification of the upgrade went through the new Updates module, signifying another milestone for Nokia in having a deployment method that actually works. The biggest change seems to be the browser. Called Anna - the latest browser has a much better UI compared to the previous one and seems more stable upon initial use. Memory management seems to have gotten better, as there is more free space available. And playing catch-up the current upgrade includes a “Slide to Unlock” option to unlock the screen. Maybe the Nokia 5800 is the perfect test-bed to check new features on - extra large installed base that are conveniently segregated by Product Codes; a phone with a strong hardware spec that does not seem seriously dated three years in; and a group of customers that Nokia desperately wants to keep in the family and not lose to the iOS or Android camps. Whatever be the reason, the upgrades are rolling out and for that, we are thankful. Sunday did not start well for my Thrive. I settled down with a cup of coffee to consume some video material, while using a soft cloth to gently wipe down the fingerprints on the screen. Halfway through the video watching my left hand, which was holding the tablet, started to ache. So I switched hands, when I noticed this hairline crack right under where I had just been holding it. As I was saying, Sunday did not start well for me either. We obviously went into a tizzy, trying to figure out what went wrong - did we drop it (no), did we crack it against something (no), was there a goblin in the house that goes about cracking LCD screens (no). Until the answer was fairly obvious, the glass cracked as I was holding the tablet one-handed and cleaning screen while watching a video. Turns out, I was not the only case of this happening. Amazon has an eerily similar story, another dealing with a hairline crack and one with a peel-off LCD. Others have stories of shattered glass after a short drop. ThriveForums.org has this heroic tale of a dropped tablet and it's reincarnation. Now here is my experience. I called up Toshiba on their customer support number (1-800-457-7777) to see if this would be covered by the standard warranty - No. They suggested I instead contact their out of warranty repair services. Turns out their starting quote for repairing the LCD is $354. 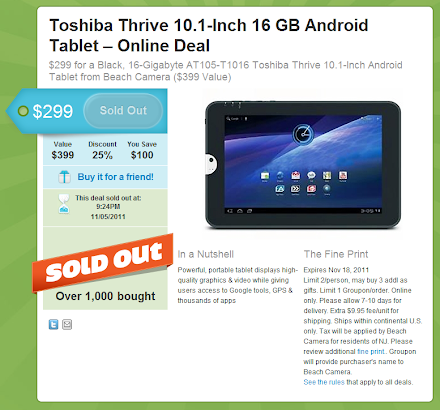 Which is about $55 more than what I paid for the tablet. In summation, the warranty does not cover it, and repairing it costs more than what I paid for the tablet. The obvious choice, I thought, was to kiss the warranty goodbye and do it myself. That is when it started to really stink. NPD (National Parts Depot) is the parts supplier for Toshiba in the US. 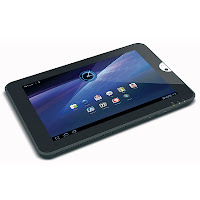 At the beginning of the year, they carried the replacement touchscreen and (4) sponges for $82 plus shipping. At some point, Toshiba stopped fulfilling orders for that part, and instead started to just sell the top case assembly for $180 plus shipping. I get that LCD screens crack. I understand if it is too expensive for Toshiba to repair it for me. But when it feels like Toshiba systematically believes it needs to make money by making cheap parts scarce - it is time to stop encouraging such companies. Sorry guys, no more Toshiba purchases from me. I am just going to use the Thrive as-is and see how long it lasts, while buying exactly diddly-squat worth of accessories. Thanks for leaving a really bad taste in the mouth. Just had my Toshiba Thrive tell me that it has a system update waiting for me, to upgrade the Android version from Honeycomb 3.1 to 3.2. This is obviously the first step in the hopes of an eventual upgrade to Ice Cream Sandwich. The upgrade is a significant one and it is recommended that you do this over a WiFi connection and with the charger plugged in. All did not start well with the upgrade however. The first attempt seemed to have bricked the gadget. The tablet did not restart and the on/off button wouldn't make any impression on it. However, once I removed the battery and replaced it, the upgrade continued as if nothing had happened. Here is the new version! More impressions once I've had a chance to play with the device more. Now that I've had a bit of time to play with my new fondle-slab, it is time to delve a bit more into what seems to be an odd philosophy from Toshiba in putting together the Thrive. 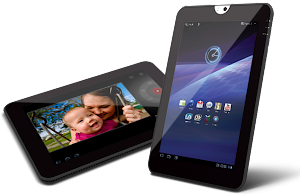 The tablet comes with a near-vanilla version of the Android Honeycomb 3.1 OS, with a few useful Toshiba customizations and utilities. Then there is a curious collection of trial-ware and general crud, topped off with a collection of basic Google mobile goodies. Very little thought seems to have gone into in this - almost as if Toshiba was trying to be recklessly indifferent to its customers. First the good news - full marks for minimal changes to the stock Honeycomb installation. Keeps the tablet zipping along without additional overhead while keeping the option open for future upgrades (Ice Cream Sandwich anyone?). That said, there aren't too many indications that Toshiba is going to upgrade, unlike Samsung or HTC. There is then the matter of custom tools that Toshiba built for the occasion. They range from the very useful, like the Service Station and File Manager to the bug-ridden Media Player and the after-thoughts like the App Place and BookPlace™. The App Place is the strangest. It does not offer much more than the Android Marketplace, is not mandatory and yet is an app one cannot uninstall. Clearly as useful as the points system on Who's line is it anyway?. If Toshiba's app collection is a puzzle, it's third party catalog is a disaster. Outside of the plugins for Adobe® AIR® and Flash, the rest are trial versions of tools that we probably have better, free alternates available for. To add insult to injury, one cannot uninstall them - not even when you buy the full version. I get that there is an economic reason to include trial versions, but the inability to uninstall is little more than spite. If ever the argument was, “Hey, we think these are must-have apps, so try them out and buy them so we can a cut of the revenue”, there is no sign of it. Instead, the pitch now is, “I don't know or care if you like these apps, but because others have uninstalled them in the past, we are not gonna let you.”. Seems like a rather haphazard way of gaining supporters among your customers. Just try searching for Kaspersky+ Thrive and you can sense the frustration. Dictating how you want others to use your device is a futile exercise - Apple gets away with it, because they can. Toshiba cannot. So whoever is making the final call on what to include and what not to, remember this - you are not Apple. Don't act like them. Nokia's near and distant future? If you need a break from all the bad news that seems to be following Nokia everywhere, there are things afoot with the Finnish giant, suggesting all is not done with the company after their momentous decision to hitch their wagon to Microsoft Mobile. The first one is a story of Lumia 800, a product of the above decision. Finally a focus on design, that GigaOm calls Nokia's iPhone moment. The second is more esoteric. A phone that will probably never see the insides of a retail store, but as a concept is somewhere between intriguing and stunning. I cannot quite make up my mind on which it is. For someone who grew up with the brand being synonymous with mobile phones, any sign of Nokia fighting, is a welcome sign indeed. I got me a tablet. Or as Register prefers to call it, a fondle-slab. This Groupon, got things rolling for me. The price point was close enough, that I could get into the world of tablets without the worry that I'd have a super-expensive paper weight if I figured the fondle-slab form factor was not for me. First impressions, the Thrive is a great device. Feels a tad chunky coming out of the box, but on the flip side, the rubberized back feels very safe and the thickness allows it to be gripped well. One is not constantly worried that it is a matter of time before sweat on your palm will cause the tablet to slip. Logging in with your Google account means that all of your data comes synchronized right away. All your contacts are in the contacts app, Gmail is up and running and the Photo viewer displays all your Picasa albums - all with no further configuration from you. I know this is true of all Android gadgets, but the effect is scary and giddy at the same time. Final first impression - the screen. 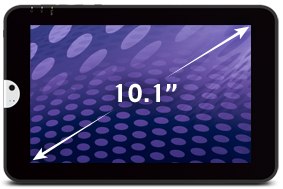 The 10.1 inch display packs in a resolution of 1280 by 800 pixels. The device is powered by the NVIDIA Tegra chip, withe graphics handled by a GeForce card. This graphics focused setup churns out crisp and smooth graphics, without a hint of hesitation. The resolution is so good, that looking at my made-for-web 600x400 crops from Picasa in full screen, made them look - ugly. The capacitive multi-touch screen is very responsive, making the user interface thus far, a real pleasure. Came across this pretty awesome piece of hardware - a well-built open source Network Accessible Storage (NAS) - called Evercube. 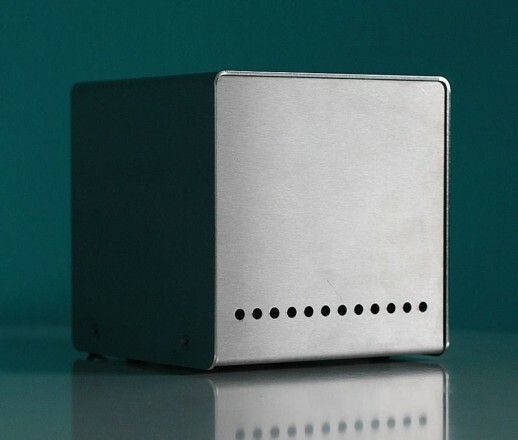 The design is open hardware, available under a Creative Commons Attribution license. And it looks good as well - a stainless steel 6-inch cube, housing five 2.5" hard drives - not the big drives but those smaller laptop ones. Which makes it quiet enough to run in the living room. But then it is expensive. So - maybe not the best use of the monies, but never hurts to know that there are open source options that look good.